...... oscillation on the same frequency. And it sounds like guitar is tuned. But actually own string frequency can greatly differ from reference tone. That's why preferably to use passive system which only listen and does not provide any sound oscillations. * Tune you guitar with very high accuracy. * Choose one from multiply tunings. * Tune guitar with no electric signal output by using general microphone. * Tune your guitar comparing the sound of guitar to produced midi tones. Tune your guitar or other stringed instrument. 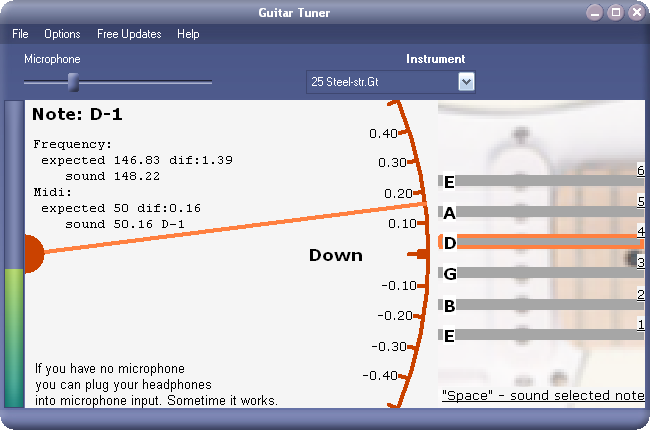 Qweas is providing links to Xitona Guitar Tuner 1.2.0.0 as a courtesy, and makes no representations regarding Xitona Guitar Tuner or any other applications or any information related thereto. Any questions, complaints or claims regarding this application Xitona Guitar Tuner 1.2.0.0 must be directed to the appropriate software vendor. You may click the publisher link of Xitona Guitar Tuner on the top of this page to get more details about the vendor.